This flagholder was found in Erie County PA by Bill Klauk. We don't really know what it is or anything about the organization that placed it. Any ideas or information welcome. 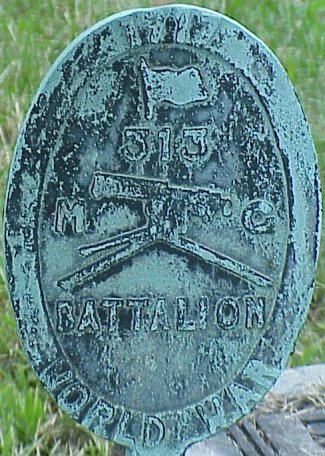 After posting a query on the PAERIE-L maillist, and getting feedback from several people, the 313th Machine Gun Battalion was part of the 80th Division. After visiting two other local cemeteries and finding this flagholder 7 or 8 more times (I didn't have my camera with me), I guessed that this may have been a unit made up with a lot of Erie people. After asking and getting a reply from the 80th Division Veterans contact, it seems (but not confirmed) that the 313MGB may have been in today's terms, Army Reserve, after WW1 as one person mentioned to me that their grandfather was a member and their grandmother was in the auxilary. I need to return and record all of the names, dates and other gravestone info on all of the ones I saw and do some more research on the origin of the flagholder.